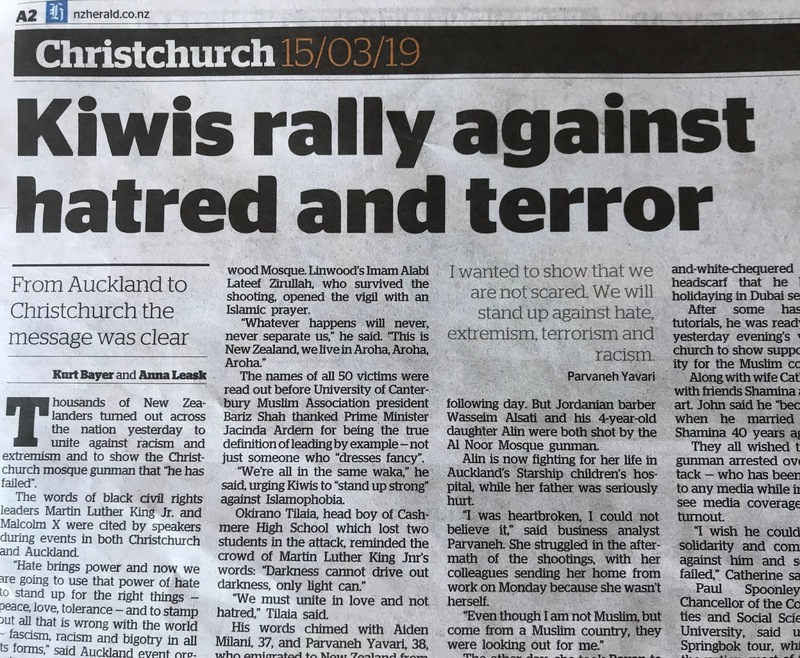 We transitioned to the South Island and an arrival in Christchurch just two weeks after the shootings. The South Island is much different than the north with fewer people, higher mountains and one very large transform fault, the Alpine Fault. Map showing our route across the South Island. The right lateral Alpine transform fault runs along the western side of the Southern Alps and goes offshore just north of Doubtful Sound. Originally, Maoreki and Dunedin were not on the itinerary but the bridge to the Franz Josef Glacier was washed out days before we were to arrive. Up to one meter of rain (40 inches) fell there in a 48-hour period, washing out the bridge and our plans had to change. To say that the city was shocked at what happened would not convey the depth of it all. 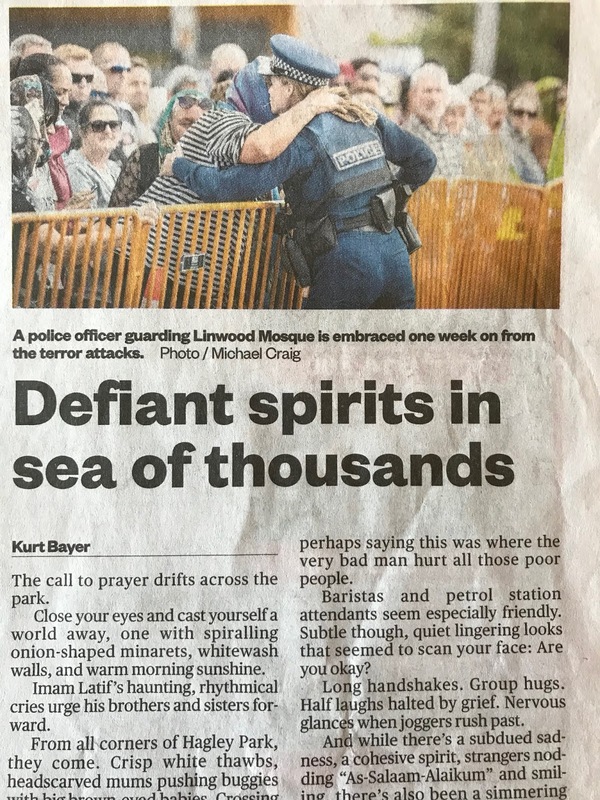 Things like this do not normally happen in quiet, little New Zealand. Yet, it did. 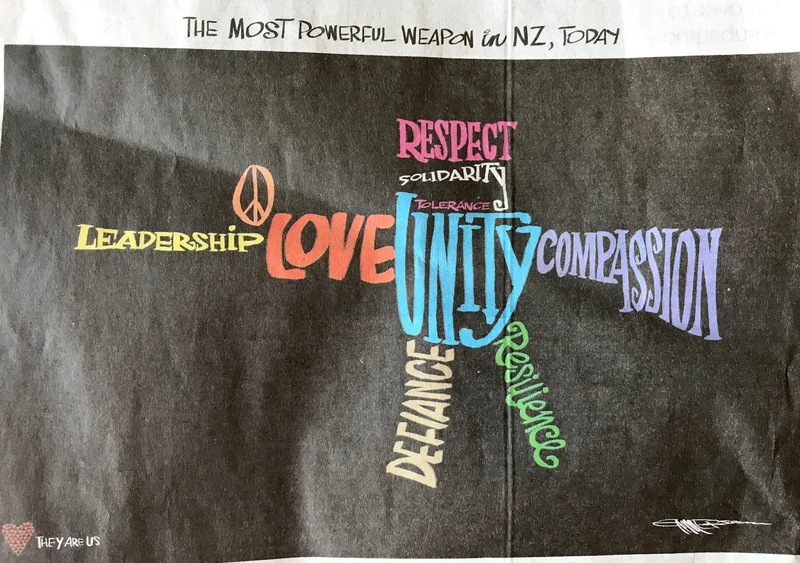 I was amazed at the way the Kiwi's came together as a nation after this. The path forward seems clear to just about everyone here. ...and we placed them on the heap of flowers that has been growing for two weeks. The memorial garden is nearly 1/2 a kilometer long! There was a great sense of respect while we were here. Tears were shed. This is the statue to Robert Falcon Scott (the leader of the second group to stand at the South Pole in 1911) along the Avon River in Christchurch. The statue was toppled in the February, 2011 earthquake and has only been replaced within the last year. 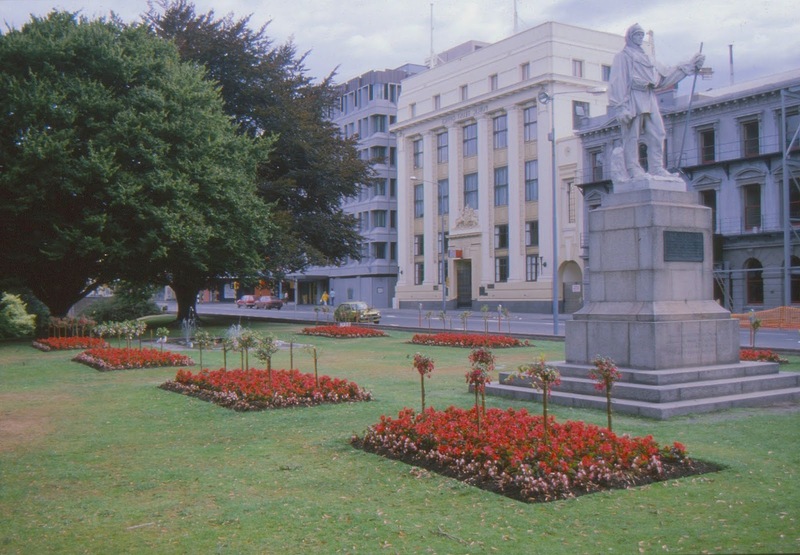 Here is a photo of the same statue I took in October, 1986 on my first trip to New Zealand. All of the buildings in the background were destroyed in the earthquake and are no longer there. Christchurch is looking to the future. It was once the "Most British City" outside of England. But no longer. The earthquake leveled many buildings downtown and there are being replaced with more modern-looking, earthquake resistant designs. 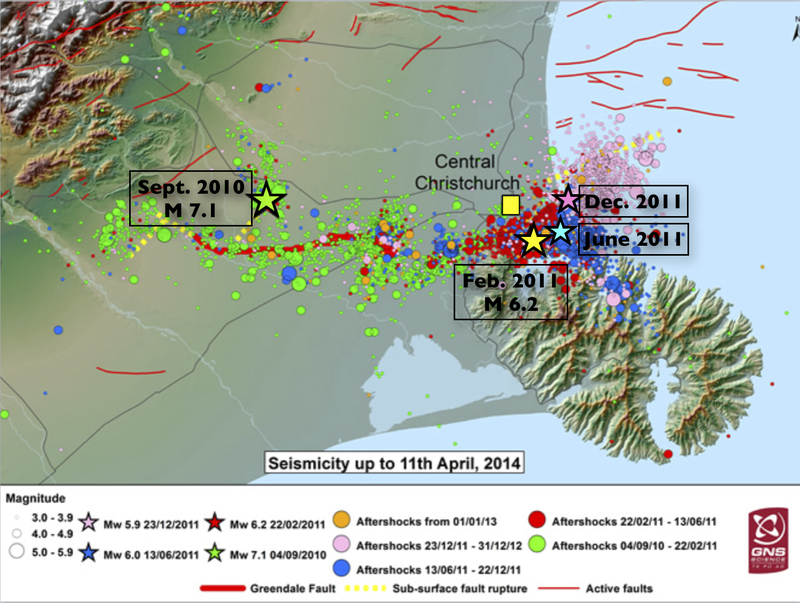 Map showing the epicenters and location of aftershocks from a series of earthquake events near Christchurch between September, 2010 and December, 2011. The red dotted line below the Sept. 2010 date shows the blind fault (previously unrecognized) that ruptured transverse to the Alpine Fault. This first quake had the largest magnitude of the four major shocks, making all others (by definition) aftershocks. The February, 2011 quake was the most damaging to the Central Business District and 185 people lost their lives due to structure collapse. Note the rounded Banks Peninsula sticking out into the Pacific Ocean, a heavily eroded, late Miocene volcano between 9 and 11 million years old. We were supposed to ride the train over the Southern Alps to Franz Josef Glacier but heavy rain closed the roads and the railroads. So we went south and passed through an interesting looking town called Oamaru, known for its limestone buildings. The limestone is quarried nearby. Much of the town's architecture has been preserved. Savory pies are a staple in New Zealand and in this out-of-the-way shop I enjoyed a Thai Green Rice pie, absolutely the best that I had on this trip. 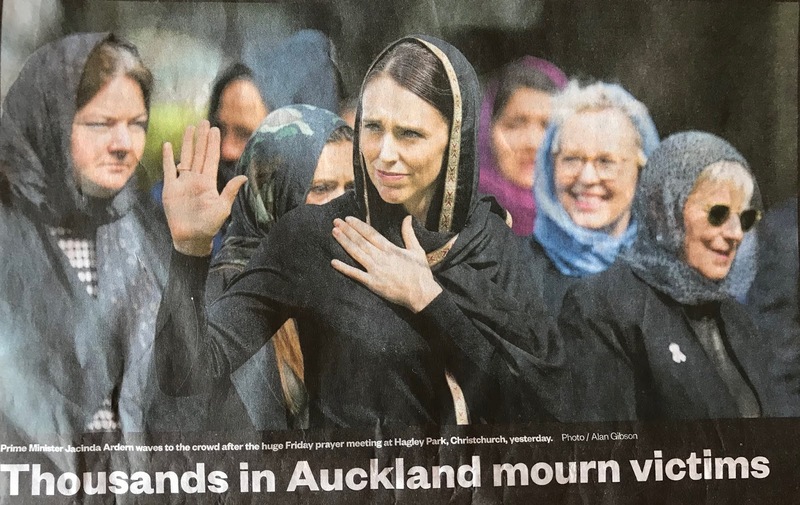 There is a dominant sentiment that I detected in New Zealand that diversity in the population is welcomed and beneficial to the country. Next stop down the east coast was the Maoreki Boulders. I had first heard of these strange beach rocks as a young geology student in the 1970s but this was my first visit to them. They are technically septaria nodules (also called concretions) and formed in a 60 million year old mudstone, the Moreki Formation. Here is a view of me next to one nodule still in place within the mudstone in the sea cliff. The waves from big storms have cracked some of the boulders, allowing us to see the inside structure. The septaria (cracks) are composed of calcite that has grown in the voids. A last look at the boulder-strewn beach and cliff behind it. Next stop Dunedin, a town of Scottish heritage and a large university, the University of Otago. Map showing the location of Dunedin at the head of the Otago Harbor. Note the circular nature of the peninsula - like the Banks Peninsula near Christchurch, this is a 16 to 10 million year old volcano that has been heavily eroded in the last 10 million years. See more about the Dunedin volcano here. The old railway station is a fine example of the architecture in this city. 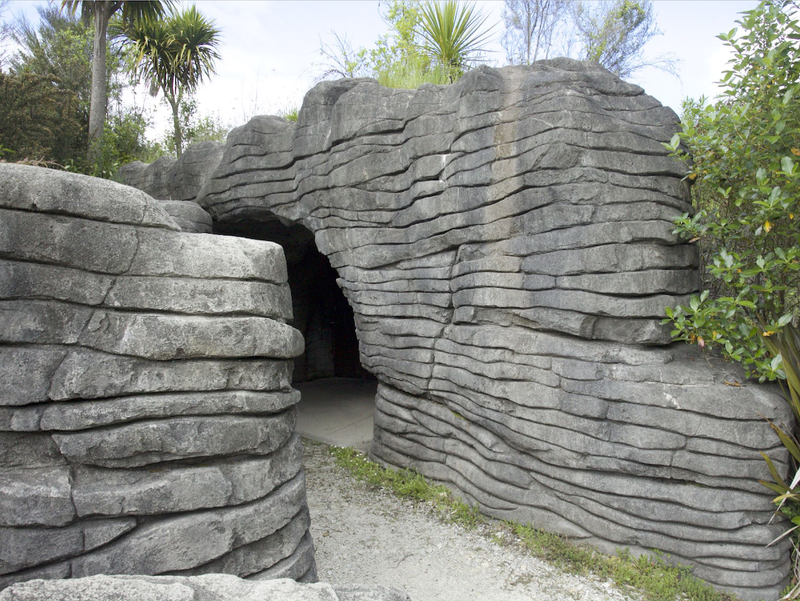 It is made of dark basalt blocks that are framed with Oamaru Limestone. The New Zealand Pigeon (Hemiphaga novaeseelandiae) was seen on the top of a tree as we toured the Otago Peninsula. As we made our way toward Queenstown, we stopped at the Kawarau Bridge where the sport of bungee jumping was invented. We arrived in time to see this person take the plunge. He really had beautiful form with a nice, swan dive off the deck and a gentle curve down to the river. I would really like to be able to do this but I know that I would chicken out on the deck. It's too close to the earth. I would jump out of an airplane (again) in a heartbeat - it's high enough up for me. You can request to barely touch the water - they have the length of the bungee down to a science - and this guy chose to do it. The rebound back up toward the bridge looked to be the most fun and this guy made it more than half way back up! The big excursion out of Queenstown was a day-long trip to Doubtful Sound. This is a map showing the Fiordland National Park, encompassing 3 million acres of pristine, virgin forests and deep fjords. The Park covers all of the mountainous terrain in the center of the map. There are 14 fjords that indent the coast. The trip includes a boat ride across the freshwater Lake Manapouri, then a bus ride over Wilmot Pass, then on another ship on Doubtful Sound. The rocks in much of the Park are Cretaceous granite and gneiss, intruded when New Zealand was still attached to the Gondwana supercontinent. Slide from one of my lectures showing the position of the southern continents during the Jurassic. Subduction occurred where the word New Zealand is located and the subducted slab melted at depth with the granite in Fiordland forming on the continental side of New Zealand. The clouds lifted as we passed the Southern Arm of Lake Manapouri. This was incredible as this area gets an average of one inch of rain very day - an average of 360 inches per year. The Captain took us on a side trip up the Northern Arm to show us these dikes running through the granite. The dikes are differentially eroded with the granite softer than the dikes. Whoa - what a day! I love these clouds. High cirrus in Fiordland! These are better exposures of the granite. From Wilmot Pass we obtained our first view of Doubtful Sound, named when Captain James Cook doubted that he could turn the H.M.S Endeavour around in the narrow fjord. The road we were traveling on was constructed in the 1960s when a hydroelectric scheme was installed on Lake Manapouri. Read about this interesting and controversial project here. New Zealand's first nationwide environmental controversy ensued because of the project, ending in a compromise with the scheme being completed but without raising the natural level of Lake Manapouri. Zoom lens view of Doubtful Sound. Not a cloud in the sky. How does one do field geology in a place covered in vegetation? A perfectly eroded U-shaped valley in the upper end of Doubtful Sound. The amount of ice that was here just 14,000 years ago is impressive. We made it all the way out to the mouth of Doubtful Sound and the Tasman Sea. Only 2,000 miles to Tasmania! Doubtful Sound is not technically a sound, although that is the name Captain Cook gave it. A sound is a shallow river valley that has been submerged beneath rising seas (or sinking land). When Cook sailed here, geology as a modern science was not yet invented. Neither was the definition of a fjord known to the British. A fjord is a glacially carved, sea-flooded entrant on a coastline. These tree ferns on the shore were so damn photogenic. The vegetation in New Zealand has suffered much from the arrival humans but in Fiordland National Park Park, it is preserved. This reminded me of what the forests in Gondwana might have looked like. Another side arm in the fjord. This concludes my trip to New Zealand. I'll be back next year with Smithsonian Journeys. For about a week, I toured the North Island of New Zealand with ten travelers on a Smithsonian Journeys adventure called Journey Through New Zealand. The North Island is where volcanism, geysers, mud pots, and hot springs play an oversized role in shaping this very active landscape. We visited and witnessed many of the features left behind by these dynamic forces. 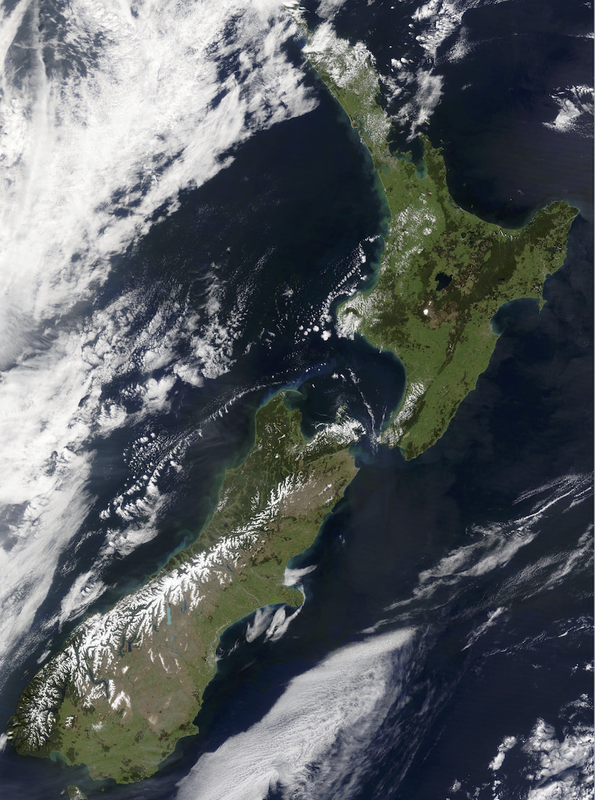 This is a true color satellite image of New Zealand on a relatively rare cloud-free day. Blueish Lake Taupo is clearly visible in the center of the North Island and the white spine of the snow-clad Southern Alps is also obvious on the South Island. 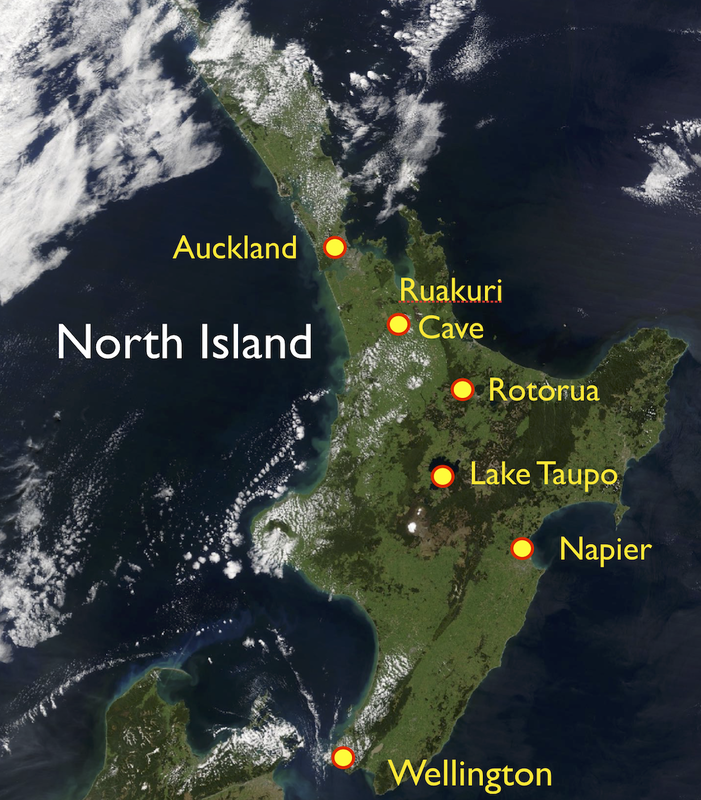 Zooming in on the same image to the North Island with our stops listed. I flew internationally into Auckland and traveled overland to Rotorua, Lake Taupo, Napier, and the capital at Wellington. A view of the Central Business District (CBD) of Auckland from across Waitemata Bay at Devonport. The view is to the southwest. Auckland was built within a basaltic volcanic field that is still active! This photo is from my trip in 2017 to New Zealand. A slide from my lecture to the group. Basaltic volcanism began here about 250,000 years ago. This image, from Geoffrey Cox's book "Fountains of Fire" shows the landscape around Auckland before volcanism began and during the Ice Age, when when sea level was about 300 feet lower than present. (The modern shoreline in Auckland can be seen as the faint dashed line). I have annotated the future CBD (shown in the photo above this) and the International Airport where I arrived. Note that the Waitemata River in the top of the diagram flows east into the Pacific Ocean (left to right), but the Manukau River flows opposite this towards the west and into the Tasman Sea. Each yellow circle represents one of the approximately 50 scoria cones located in central Auckland (not all 50 are within this image). The city center and international airport are also shown for reference to the previous diagram. The red circle in the upper right is Rangitoto Island and it is the most recent of the volcanoes to erupt - only about 500 years ago. This is a view of Rangitoto Island from the top of Mt. Victoria in Devonport (one of the oldest volcanoes in this field). This photo is from my trip in 2017 to New Zealand. The formation of Rangitoto Island with Maori people watching from the future site of Auckland city. Image used from "Fountains of Fire". Heading south, we passed Mt. Pirongia, a late Pliocene-Pleistocene basaltic center. The various peaks show basaltic vents on the volcano, now inactive. A native forest can still be found here. New Zealand was a land of unique wildlife and flora inherited from its separation with the Gondwana supercontinent. However, the introduction of exotic mammals and other pests, begin Ning with the Maori about 800 years ago, decimated native bird populations, with about 40% of endemic species now extinct. Therefore, the New Zealand government has strict requirements for entry into the country. I once traveled on a trip here where two of my fellow companions were fined $400 US each for having mud within their lug-soled boots. No, this is not the extreme vertical entrance to the cave we visited. But it is a natural opening in the limestone near the town of Waitomo, where a series of solution caves have been carved into the Te Kuiti Group. This marine limestone is dated at between 27 and 23 Ma, at a time when most of New Zealand was submerged beneath sea level. This is the man-made entrance to the cave, which is nearly identical to the natural outcrops of the limestone. The cavern system is extensive and has numerous speleothems (cave formations) such as stalactites, stalagmites, and curtains such this one. The caves in New Zealand are famous for their glow worms (one is curled here in the yellow oval). These are the larval stage of a dipteran fly. Their scientific name is Arachnocampa luminosa. The natural "glow" of the glow worms. 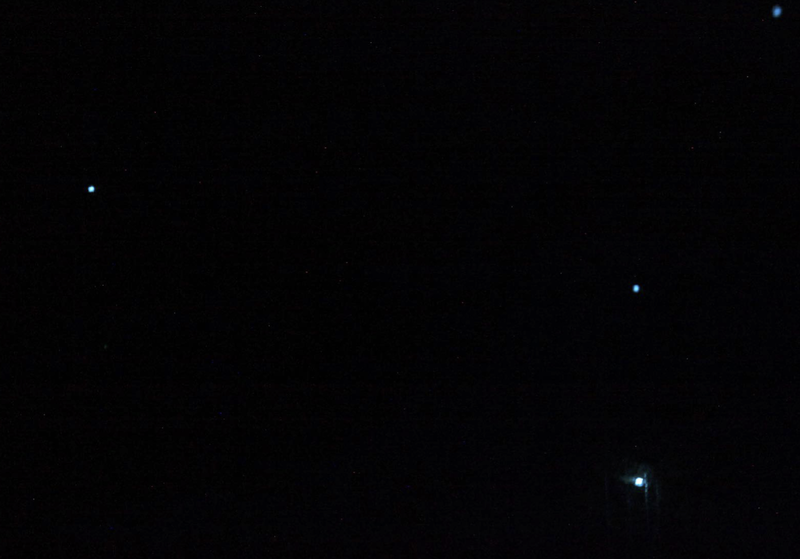 The ISO on my camera is set at 6400 and this is a hand-held image. This is the big room in Ruakuri Cave showing the many formation to be seen here. A river runs beneath this section of the cave and "blackwater rafting" is offered inside the cave. The Pohutu geyser. (This photo is from my trip to New Zealand in 2017). Tree ferns and the Pohutu geyser on March 25, 2019. This is a localized venting area within the much larger Rotorua caldera. The rim of the caldera can be seen in the distance through the steam. We arrived just as the geyser began its 20-minute display of steam and fountaining. A nearby mud pot erupts with its boiling mud. The chemistry of the thermal water is such that it dissolves some of the enclosing volcanic rock, which is rich in silica. The tiny particles of silica mix with the boiling water to create the mud. I just love boiling mud pots! At the Te Puia park, the local Maori people share their culture and crafts with the public. We enjoyed a traditional hangi, where the food is cooked in the ground traditional style. On the road south from Rotorua toward Lake Taupo. The Taupo Volcanic Zone is one of the most active, land-based volcanic areas on planet Earth. Its volcanic history is revealed through the many deposits scattered across New Zealand and out to sea. New Zealand is located in a very complex tectonic setting. First off, New Zealand is the emergent part of an 8th continent - Zealandia. The continent is outlined in the black dotted line above. Part of the continent rests upon the Pacific tectonic plate and the other is part of the Australian plate. Continental crust, rich in silica and alumina makes up the crust of all continents including Zealandia, even though 85% of its rock remains submerged beneath sea level. 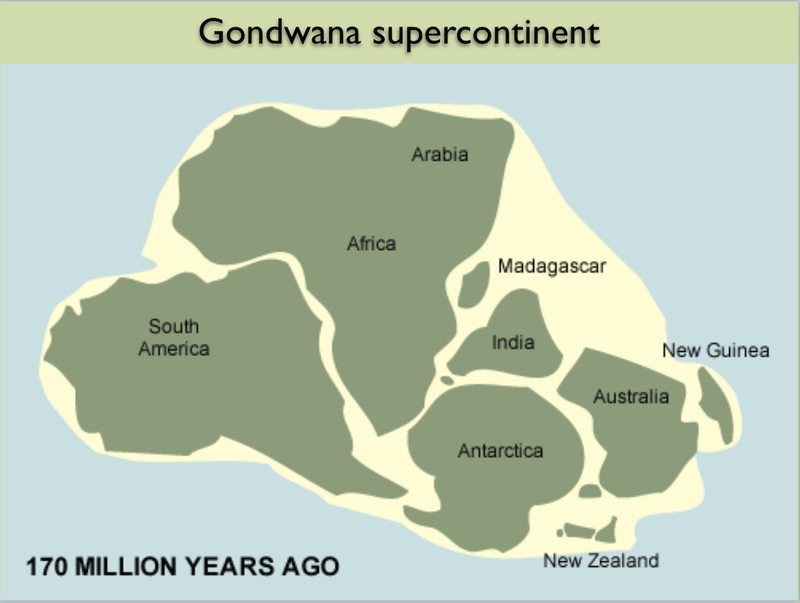 Zealandia was once part of the supercontinent Gondwana but broke away from Antarctica and Austria beginning about 85 Ma. Today New Zealand sits astride the boundary between the Pacific and Australian plates. Note however, that the two islands reside are on different plates. This explains the degree of complexity in New Zealand's geology. 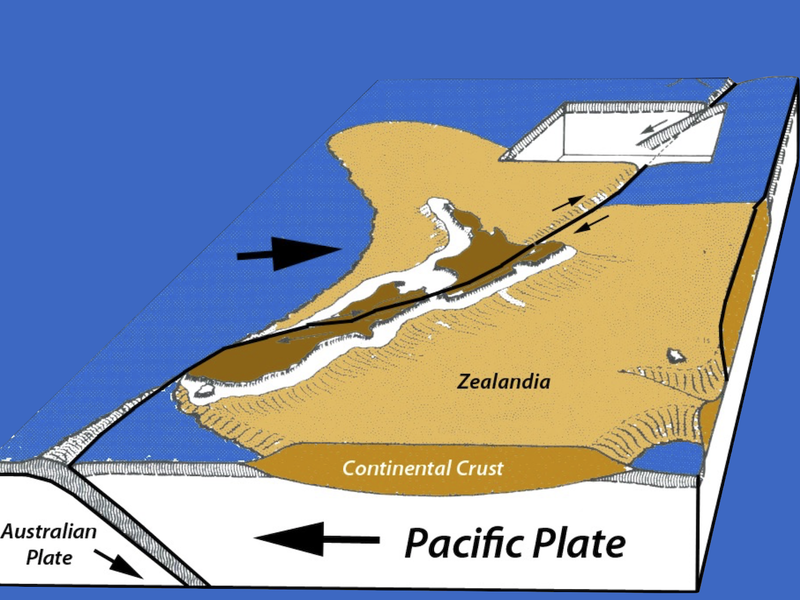 A north-projecting oblique view of Zealandia with cross-sections cut across both the southern and northern ends of the continent. 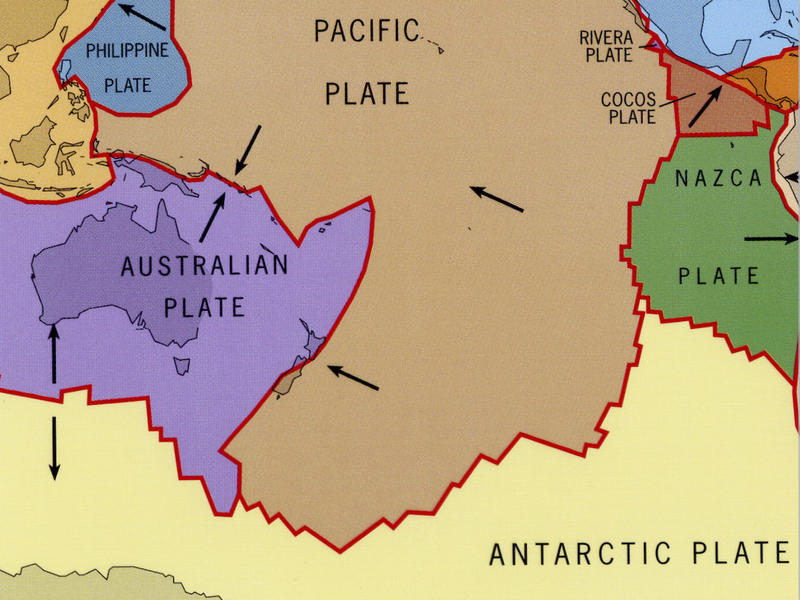 Note how the Australian plate is being subducted beneath the Pacific plate in the south, while the opposite occurs in the north with the Pacific plate subducting beneath the Australian plate. In between these two opposing subduction zones runs the Alpine fault, a right lateral offset much like our own San Andreas fault. With two opposing subduction zones and a San Andreas-type fault, it is an understatement to say that New Zealand is geologically active. Close-up of the Taupo Volcanic Zone showing the four large caldera complexes of Rotorua, Okataina, Maria, and Taupo, and the three stratovolcanoes of Tongariro, Ngauruhoe, and Ruapehu (New Zealand will challenge those who suffer from vowel-phobia). 26,500 years ago a tremendously large eruption from Taupo created the caldera there. These slides are from my lecture to the group and highlight some of the enormity of this eruption, the largest on planet Earth since the Toba (Indonesia) eruption about 71,000 years ago. The 26,500 year Taupo eruption is known as the Oruanui eruption and this illustration shows the relative amounts of material erupted in other, more well-known eruptions. About 100 cubic miles of rock was erupted. For comparison, about 1/4 of a cubic mile was erupted at Mt. St. Helens in 1980. Lake Taupo today is a quiet, peaceful place with a small town of retirees living along it quiet shores. I would imagine that most residents know something about the lake's violent past but maybe don't want to dig too deeply into the details. For myself, I find it interesting how things change with time. These changes can be readily understood by those who live in and visit Napier, a unique city on the North Island's Pacific shore. On February 3, 1931 the entire Central Business District (CBD) was destroyed in a 7.8 magnitude earthquake. Within two years, the CBD had rebuilt in a modern style for the day - what we call Art Deco style today. Only in the 1990s, when some of the buildings from this era were being razed for newer development did the residents realize that they had a treasure - a city entirely built when the rest of the world's economy was stagnant during the Great Depression. Now, Napier's CBD is a tourist draw. The building above highlights the specific time when the city was rebuilt. 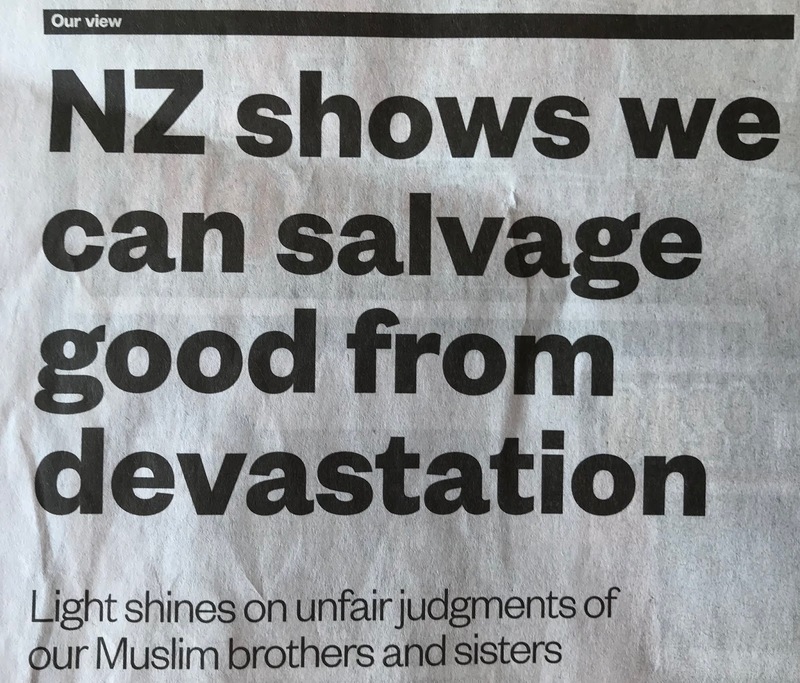 To learn more about this devastating New Zealand earthquake, see here. This could easily be a building from the 1930s movie, Superman. The Daily Telegraph was Napier's newspaper back in the day. Another Art Deco building in there CBD of Napier. Of course, I have many other photographs but free time is short on this trip and I cannot include as much as I would like. We spent the day driving south toward Wellington, New Zealand's seat of Parliament and its capital. The city is located on a beautiful bay with many long-running ridges trending southwest-northeast. This fabric is due to a splay of faults that also have historic movements resulting in tragic human casualties. The January 23, 1855 earthquake with a magnitude of 8.2-8.3 is the strongest jolt in New Zealand in historic time. A whopping 59 feet of lateral offset was documented from this one quake. 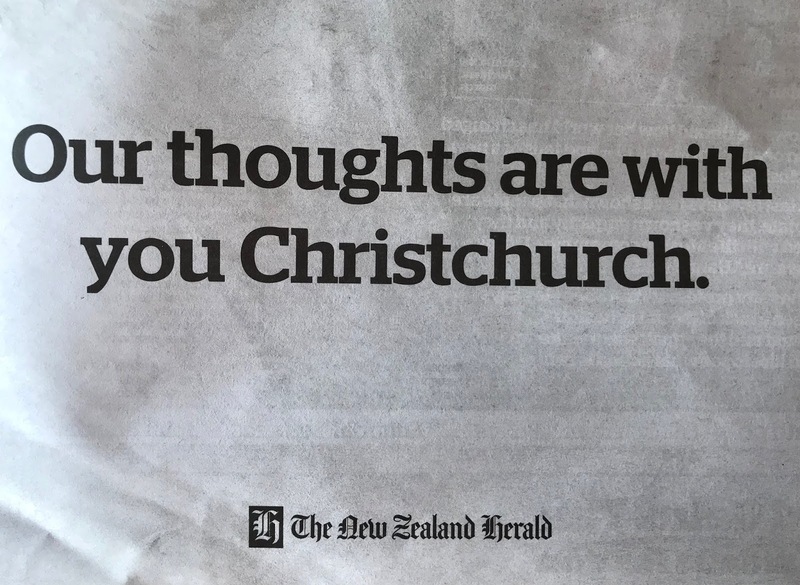 It seems as if we have been traveling in New Zealand with me talking to our small group only about one devastating event after the other. Don't think for a single moment that I am not keenly aware of how this must appear to my fellow companions, who may not have the time-honed ability to separate the stupendous natural history story of these events from the resulting loss of life and property. The scale of the events here is impressive and New Zealand is a MUST visit for anyone with an interest in the natural world and especially geology. The red cable cars climb the hills to the west. A view to the west from Mt. Victoria toward the CBD and the harbor area. What a lovely setting and we all loved this gentile city of about 400,000 people. Note the faceted spurs on the hill in the upper right of the photo. These triangular-shaped spurs highlighted here in sunlight denote where the Wellington fault.. I'm traveling in New Zealand with Smithsonian Journeys and a wonderful, small group of ten people. We've toured the North Island and I'll be posting photos in the next few days. 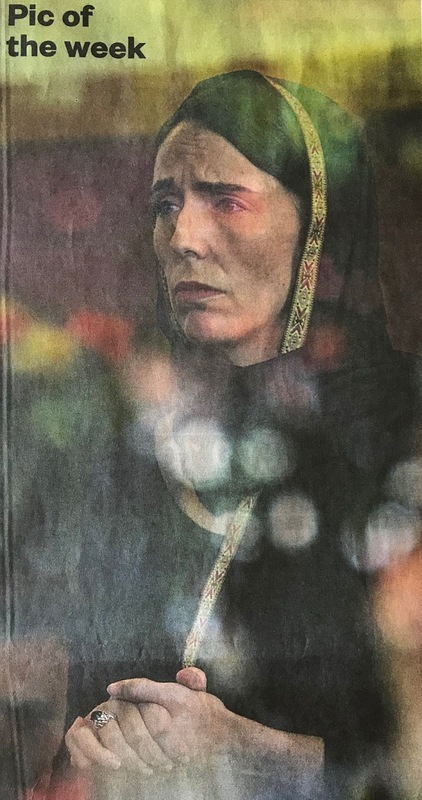 Friday, March 29 is a National Day of Mourning for the shooting victims in Christchurch, where I will be on March 30 and 31. 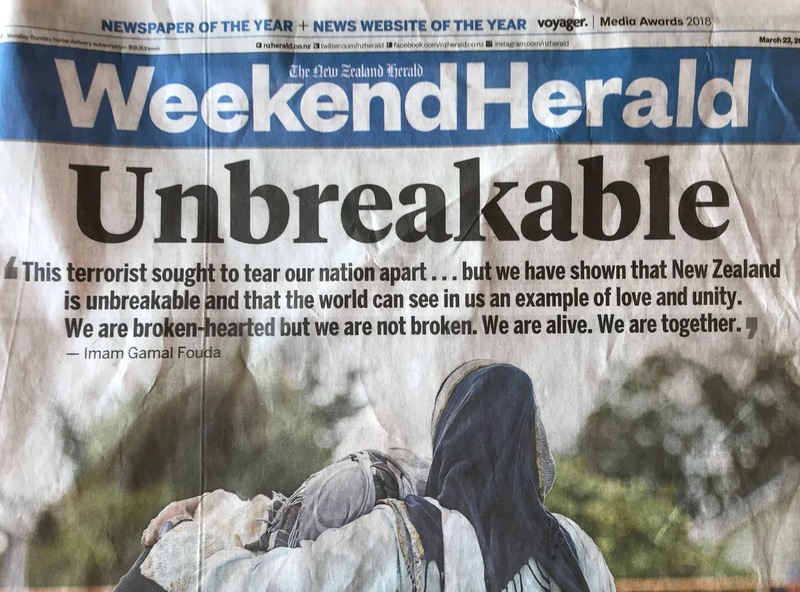 As you can imagine, a small, safe country like this is reeling from the trauma To begin my postings from here, I include headlines from a single edition of the Auckland newspaper, the New Zealand Herald. I hope this will give you sense of the gravity of the situation here. 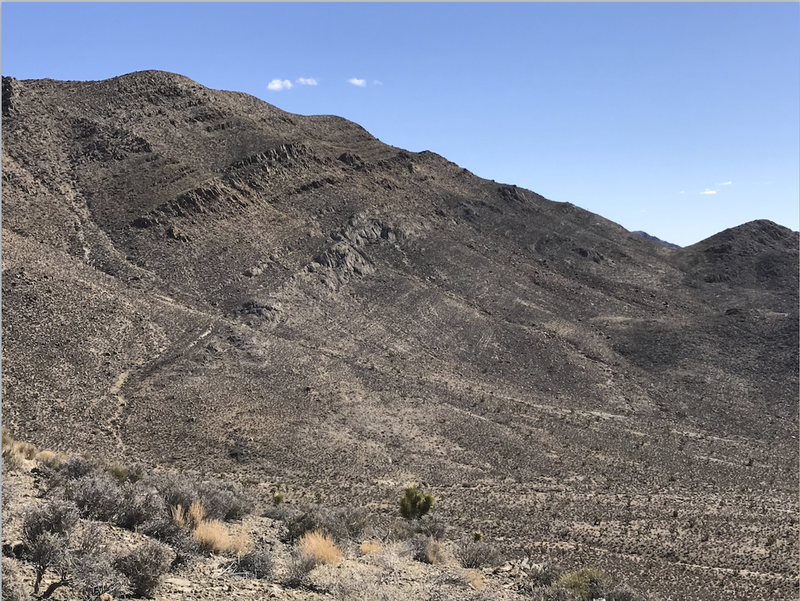 Last week I accompanied my colleague Dr. John Warme, retired professor of geology from the Colorado School of Mines, and three other geologists to look at the Alamo breccia, a quite out-of-place layer of conglomerate sandwiched within many thousands of feet of fine-grained, shallow marine limestone. The opportunity was not to be missed and so I was off to southern Nevada. 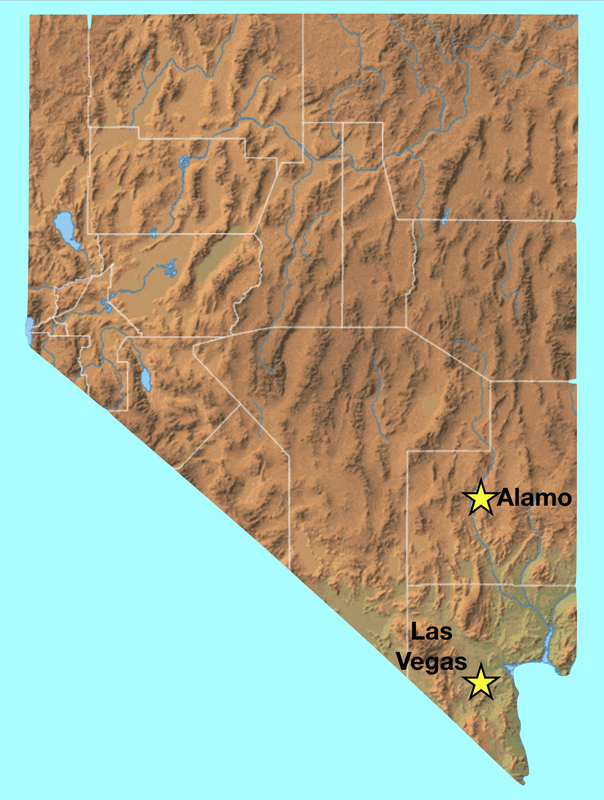 Physiographic map of Nevada showing the location of the type section of the Alamo breccia, about 100 miles north of Las Vegas. Note the fabric of mountain ranges within Nevada that trend north to south. This pattern is due to extension (stretching) of the Earth's crust that began about 20 to 17 Ma (millions of years ago). 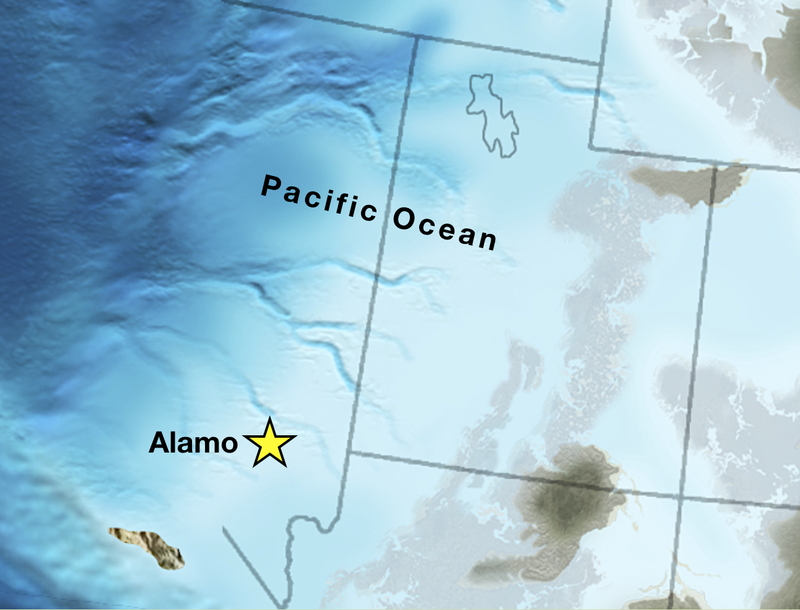 Blocks of crust were pulled apart, likely as a result of the subduction of the East Pacific Rise beneath this part of North America. As the crust stretched, once continuous sheets of rock were faulted and rotated along a north/south trend. Nevada has widened twice as much as it was prior to 20 Ma. That's 100% extension! Dr. John Warme stands in front of the geologic map of Nevada at the beginning of our field trip. The entire state is located within the Basin and Range Province, which also includes eastern California, western Utah and south and central Arizona. On the ground, this is what the Basin and Range looks like. Rocks in the foreground are also exposed in the far mountain range but they are separated by faults and the extension that occurred here. To understand this story, it is helpful to see what this part of North America looked like around 380 Ma. The emergent part of North America lay to the east and off the right side of the map. An early incarnation of the Pacific Ocean covered most of Utah and Nevada as was part of the continental shelf. These conditions were present for hundreds of millions of years here! Thick accumulations of quiet-water limestone and shale piled up over this period of time to over 130,000 feet. In spite of their later deformation, the rocks are essentially limestone, after limestone, after limestone. Evidence from the quiet-water days of the Late Devonian comes from the Guilmette Formation. Here a stromatoporoid sponge fossil lies in quiet repose on a tilted bed of limestone. These stromatoporoids sometimes made reef-like colonies. Silica-replacement of the calcium "shell" highlights the outline of the sponges. This example shows the concentric layers within the sponge. These fossils provide evidence for quiet, shallow marine settings. With apologies to paleontologists, this was quite boring tectonically. Except for this - an approximately 300-foot section of coarse, angular breccia (foreground) found within the Guilmette Formation. This anomalous deposit is the subject of this posting. 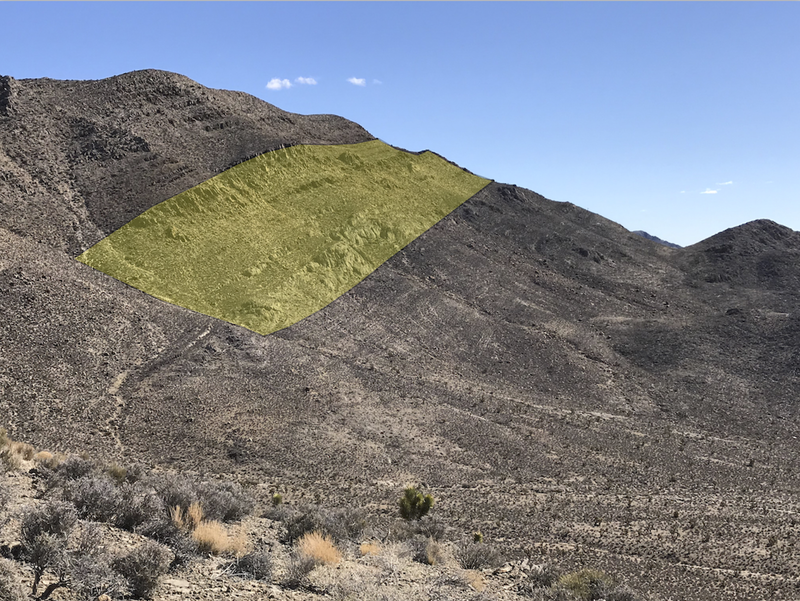 To further complicate the setting, this area was compressed and the crust was shortened extensively by a mountain building event before the crust was stretched and thinned. The once horizontal layers of limestone were squished and interleaved along giant thrust faults stacking rocks over themselves. See the diagram above for how the layers became stacked. When a geologist goes into the field here, they have to mentally "remove" the compressive event and the thinning event to sense the nature of the rocks before they were deformed. This is the how the paleogeography can be envisioned. One can rather easily see a pronounced tilt to the rocks in this view. But within the tilted beds are numerous thrust faults that reveal that the layers were also compressed and shorted before they were stretched. Yikes - makes a guy like me run for the Colorado Plateau where the rocks are still essentially horizontal like the day they were born! From the South Hancock Hills near Hancock Pass on State Highway 375 a view of the section can be seen. The lighter-colored bed of limestone in the center of the photo is a part of the Alamo breccia. A view of the same photograph with the breccia horizon highlighted in yellow. So, let's look at the Alamo breccia up close. It contains pieces of rock (called clasts) of the very same limestone rocks and are always quite angular when found. This suggests they were emplaced quickly without prolonged agitation, which would tend to round their edges. There are many beds of this material within the breccia. The mechanical pencil (center right) lies on the contact between in-place limestone below and brecciated limestone above. This represents the surface upon which the breccia was emplaced. Close-up of the same contact (photo center). Note the rather distinct bed of breccia with lighter-colored and angular clasts within a darker matrix. John Warme next to a dislodged boulder of the Alamo breccia. What is inherently interesting about the Alamo breccia are seemingly coherent beds of limestone within it. Here the 1/2 meter-long rock hammer lies across a brecciated horizon in the middle part of the photo. Note the small clasts within an apparent coherent bed above that. But a lens-shaped block (with its left margin terminating at the top of the hammer) is exposed on top. This suggests that clasts of ANY size can be found in the breccia. Like this - note the twin beds of limestone "floating" on top of the clastic breccia. These were likely shoved into the mobile mass of breccia without becoming disrupted. Or this! Note the overturned bed of limestone, surely pushed around to obtain this shape. Wow! And this - a series of beds that trail off to the left into equidimensional breccia. How does this happen? Dr. Warme was made aware of this anomalous occurrence of breccia in January, 1991, when a PhD student told him about breccia he saw in the Guilmette Formation. They eventually ruled out tectonic collapse of the continental shelf, since it was rather featureless and was located in a stable environment. Plus, the scale of the breccia and the texture hinted at something more catastrophic, especially when it was found that some clasts are 500 meters long! A meteoroid impact in the Late Devonian was the interpretation! Rocks of this age are full of fossils called conodonts and they provide rather tight ages for when this impact might have occurred. Conodonts were ubiquitous in early Paleozoic oceans worldwide but evolved and changed rapidly. Thus, they make great index fossils, since their evolution can be traced in the rocks. The Alamo breccia was emplaced during the punctata conodont stage, about 382 million years ago. A paper on Late Devonian conodont stratigraphy in Nevada can be downloaded here. Although not age-diagnostic, Warme also took us to these rather large stromatolite fossils exposed beneath the breccia (still in place). Note the cauliflower shape to these 3-4 feet high stromatolites. Another view of two stromatolites side by side. These petroglyphs were found on a yellow sandstone boulder that had rolled down from above the breccia horizon. Warme thinks the sandstone may have resulted from uplift of the ocean floor concentrically around the impact zone. This feature in the southern Hiko Hills was our destination on another day of the field trip. We were headed to the lens-shaped beds of lighter-colored limestone in the center of the hill. These are part of the Alamo breccia. No trails here - just walk where you can. As we went up the hill, we arrived at the top surface of the breccia deposit, seen here where the lower, darker cliff of limestone gives way to an upper slope that angles down to the left. At the top of the breccia are graded beds (where the clasts get smaller towards the top) interpreted by Warme as tsunamites - rocks formed when giant tsunamis raced across the sea after impact. This is not a great example of how these tsunamites fine upward, but the rock is from the tsunami horizon. Incredible to think that all of this - 300 feet of debris - may have been emplaced within a matter of hours 382 million years ago! Still gotta go higher to see one more thing. Believe it or not, the lighter gray bed in the center of this photo is likely a very large clast that was transported eastward from the impact. It remained largely intact as it came to rest here. We finally made it to a cliff where a lighter-colored bed, almost yellowish, was exposed. Closer examination revealed the presence of spheres within a limey matrix. Closer still, it was observed that the spheres had concentric interiors. Hmm? The finger points to one of these features. containing a nucleus, a mantle and a thin crust. It turns out that when the bolide (or comet) impacted the earth, it vaporized the previously consolidated limestone layers and water from the ocean. A gigantic cloud of pulverized limestone and vaporized water was injected into the rising and very hot mushroom cloud. The temperature was so intense that the limestone powder was cooked into quick lime - essentially cement. This mixed with the water vapor in the cloud to create nodules of cement that then adhered to more pulverized quick lime (like the way a snowball accumulates more snow as it rolls downhill). Warme was advised.. Finally! On our way to Antarctica. But as we rounded the east end of South Georgia Island, we encountered Beaufort 10 winds - at our back. Fortunately, this was not as bad as if we would have had to charge into it. An example of the wake given off as our ship plied the Southern Ocean waters. Note the large tabular iceberg in the fat distance. The height of that ice cliff is 200 feet, meaning that the height of the iceberg including the submerged portion is about 1,800 feet! The Captain told us it was about 16 miles long. That is one large iceberg. 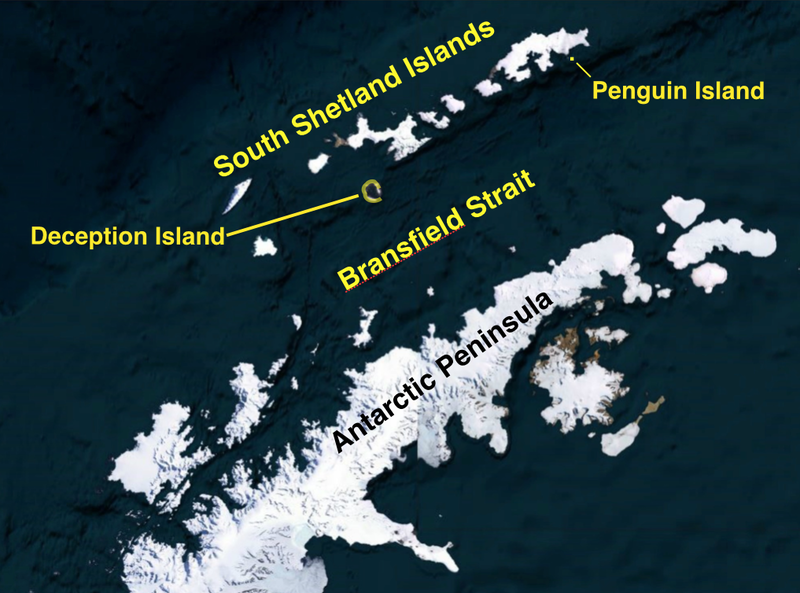 Location map showing the South Shetland Islands, Bransfield Strait, and two volcanic islands - Penguin and Deception - that we visited on this voyage. We arrived early to Antarctica and were able to make a late afternoon landing on Penguin Island. You can see by its shape that it might be a volcano and in fact it is a scoria (cinder) cone. The ramparts along its edge are lava flows that issued from the base of the cone in the waning stages of its eruptive cycle. Once ashore, the scoria and basalt lava is obvious. This cone has been active in last few hundreds of years. This is a panorama shot of the summit crater taken with the Pano function on the iPhone 7 Plus. While it may look as if I just cropped the bottom and top of a normal photo, you can see that the view of the crater is far too wide to capture that way. This is a close-up of the crater area showing a possible vent on the left (differential erosion casing it to stand higher than the loose scoria that surrounds it) and a resurgent crater on the floor of the larger crater. Wow! I love Penguin Island - except the name! There are zillions of islands with penguins on them but only a handful of scoria cones. How this one got the name "Penguin" is beyond me! From the summit looking north to the north end of King George Island, the largest island of the South Shetland chain and covered in glacial ice. Le Lyrial is anchored offshore in the brilliant late-afternoon light. Our ship carried about 165 passengers on this voyage, 19 staff members and about 130 crew members. I was working for Abercrombie and Kent, who chartered the ship from a French company Ponant. There is a three minute promotional video that shows much of what happens on these voyages here. I provide this mainly for the wonderful images of the landscape and not so much for the great food that is featured - the lecture program is only touched upon briefly by the narrator. A wider view from a slightly different vantage. On the beach is a nearly complete skeleton of a whale with numerous Chinstrap penguins for scale. Ohh - that is how the island received its name! The January 26 sunset from Penguin Island, Antarctica. Rockscape from Half Moon Island. I saw a variety of extrusive and intrusive rocks here. This part of Antarctica shows evidence similar to much of the western Americas with Mesozoic subduction leading the arc volcanism and plutonism. Similar to what is found in the Sierra Nevada of California and the Andes in South America. Map of Deception Island showing our route into the narrow entrance of the caldera called Neptunes Bellows and our hiking destination at Telefon Bay. Wide-angle view of Neptunes Bellows. The channel inside is quite narrow and at least one ship wreck was observed on the opposite shore from the pre-tourist era. Hiking up to the crater formed in the 1970 eruption. Port Foster with Le Lyrial in the background. Looking in the opposite direction, a glacier has entered the crater and partially obscures it. Larry Hobbs, our cetacean expert and lecturer admires the contrast between fire and ice! Close-up of the glacier wall showing internal deformation of the ice and vertical cracks (called crevasse) where scoria has filled them. This is a very dynamic setting with ice flowing constantly and material being blown into cracks in the ice. Note the once laminar horizons in the ice that are now deformed into chevron folds as the ice flows downhill into the crater. Another Pano shot, this time of our iceberg expeditions in Zodiacs near Cuverville Island. I also drove Zodiacs for our guests. The dark water absorbs heat when the sun is out, causing a melt line to develop at the water line in the iceberg. When low tide causes the bergs to become grounded, they tilt and expose these melt lines. Another melt line is 'uplifted' during a low tide stranding. This one reveals a monolith through the arch. As the bergs melt and break apart, their center of gravity changes and they can roll and flip at a moments notice. Zodiac drivers approach large icebergs at their peril and like pilots, there are old Zodiac drivers and there are bold Zodiac drivers. But there are only wet old and bold drivers! The shapes can be quite fantastic! A portion of the submerged part of the iceberg can be seen here in this shot from our cabin balcony, about 50 feet above the water line. This is in the Ererra Channel with the Antarctic mainland in the background. A Weddell seal (Leptonychotes weddellii) lies in repose at Neko Harbor on the Antractic Peninsula. Gentoo penguins (Pygoscelis papua) lie on their rock nests at Neko Harbor. ...but instead the clouds became progressively thicker. This was the first time I had been shut-out from a transit of the Lemaire Channel in all my 26 trips to the Peninsula. These are the intrusive rocks that underlie the entire Peninsula and are Mesozoic granites and similar rocks. They form the heart of the arc with the erupted volcanic material eroded off of them. This is at Port Charcot near the Le Maire Channel. A Leopard seal (Hydrurga leptronyx) naps on a bergy bit. Our Expedition Director, Suzana Machado D'Oliveira, standing with us on the bridge of Le Lyrial. This was a wonderful cruise with a fantastic staff! I can't wait to return! 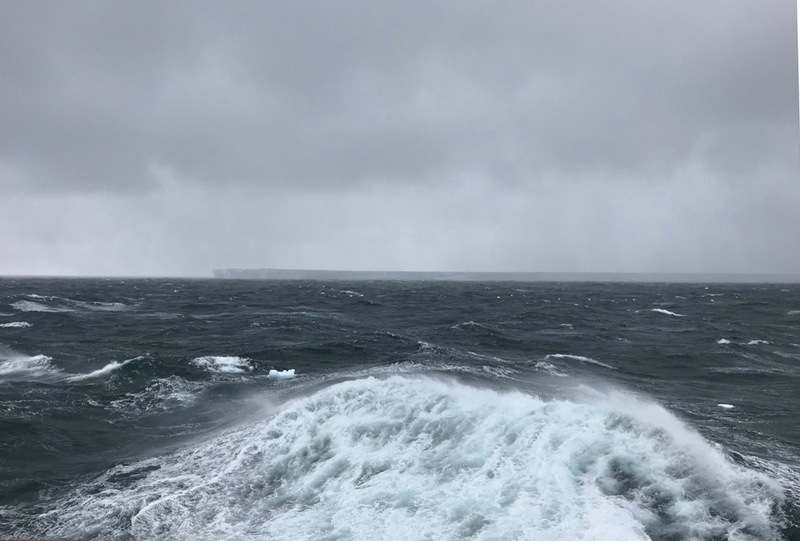 Leaving the Falkland Islands we sailed east into the Scotia Sea. The tectonic setting of this small plate is very interesting to the Antarctic traveler. A slide used in my South Georgia lecturer shows the tectonic setting of the island of South Georgia. Note how South America and the Antarctic Peninsula both bend eastward, almost as if a hard wind is blowing in the Drake Passage. 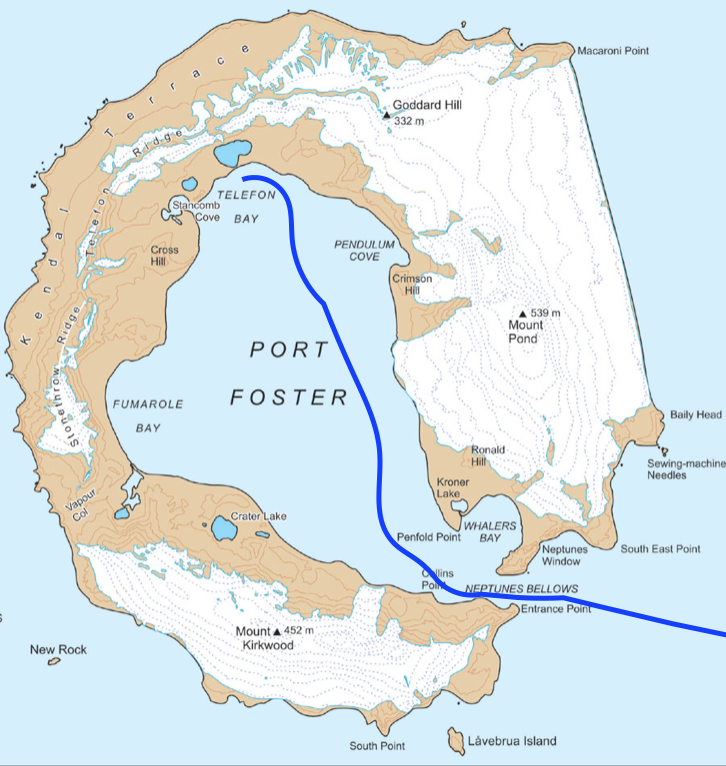 The bend is due to mantle flow from west to east that has disrupted a once continuous mountain chain linking the southern Andes with the Antarctic Peninsula. South Georgia is a continental fragment that was carried east in this breakup and the rocks there are similar to those exposed on the island of Tierra del Fuego. 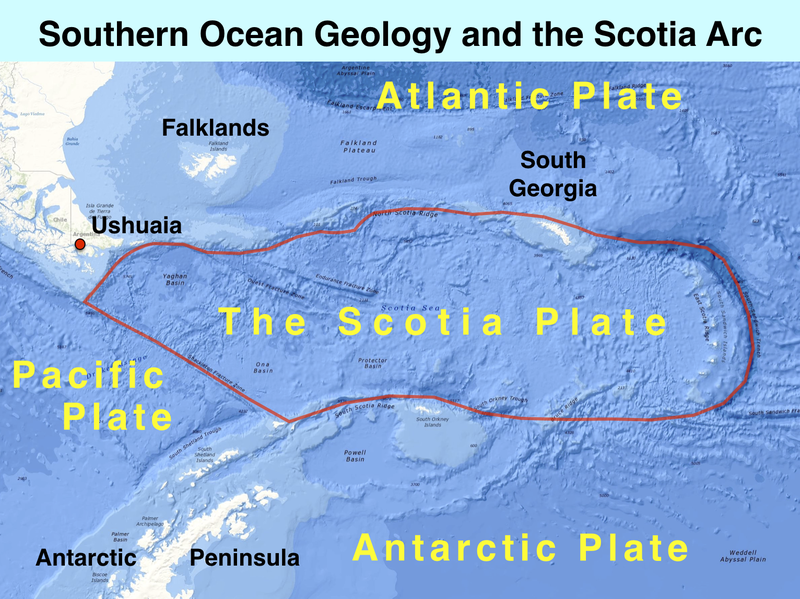 The Scotia plate is outlined in red with the north edge of plate forming the submarine Scotia ridge, and underwater cliff that will be featured in some of the photos below. We sailed for nearly 40 hours before sighting any land and the first seen was six knobs called the Shag Rocks (a shag is a type of cormorant). These rocks are the only emergent portion of another continental fragment called the Shag Rocks block. 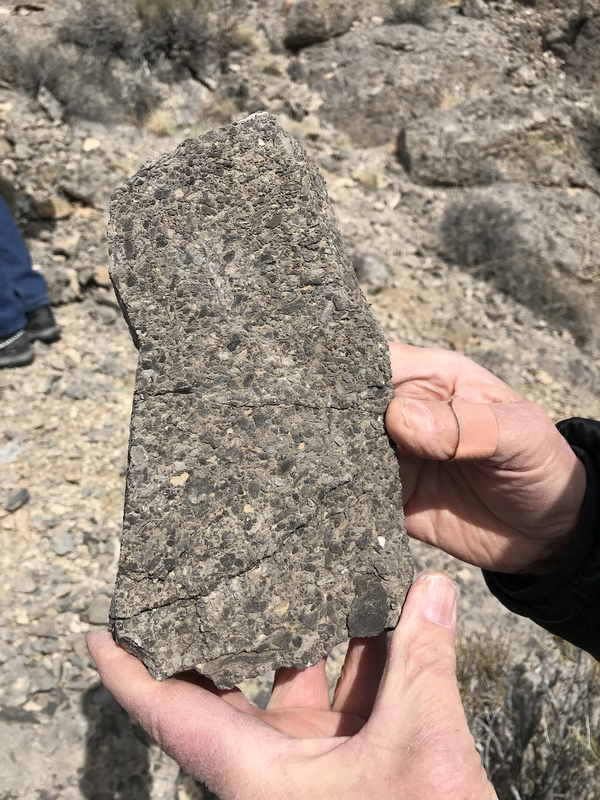 Like South Georgia, this is a shattered fragment of continental crust that was "blown" eastward when mantle flow beneath the crust here caused the breakup. A closer view of Shag Rocks. There were thousands of seabirds flying and nesting in the area. Coming upon such remote landscapes is always a thrill. A little further east, we sailed over the Scotia ridge which marks the tectonic boundary between the Atlantic and Scotia plates. The ridge forces cold, Antarctic water toward the surface which causes high productivity in the sea. It was while sailing over the ridge that we saw between 50 and 200 humpback whales feeding on the krill and other life that was being upwelled here along the ridge. Everywhere we looked there were humpback whales (Megaptera novaeangliae). I had never seen so many in one place before. It shows that the whaling stocks are making a good recovery since the end of commercial whaling in the mid-1960s. Many seabirds were also taking advantage of the nutrient-rich waters hear. We were treated to quite a show - and we hadn't even arrived yet at our destination. Our first stop on South Georgia was Salisbury Plain, where over 60,000 pairs of King penguins (Aptenodytes patagonicus) can be seen. Yes, those are penguins trailing back all the way up the slope in the right hand corner of the photo. These young chicks with their brown feathers are called oakum boys. These are perhaps the most beautiful and regal penguins (hence the name) of all 17 species of penguin. Note the penguin in the foreground that is moulting. I used this photo in one of my lecture slides, using the penguin for scale of the dike-riddled rock. A young fur seal pup was very curious of my camera. There is a 15 foot distance mandated for us to stay away from the penguins. But occasionally they will come closer to humans as they have no such regulation. South Georgia is the best place to see the King penguin on an Antarctic voyage since they are a Sub-Antarctic species and would not be seen in Antarctica. Our second day on this island would prove to have the best weather of our three day visit and this was the view from our cabin as we sailed into Stromness Bay. About 40% of South Georgia is free from glacial ice and this is another significant difference from Antarctica. Whalebones, fur seals, and a rainbow greeted us on our landing. In the background is the Stromness whaling station, the place where Sir Ernest Shackleton and two of his men walked into after making a 36-hour land crossing from the south side of the island. They arrived to announce their much delayed return from two unexpected winters in Antarctica. At the head of this valley is the Shackleton waterfall, the destination of our hike. Looking back to the beach along the hike. Note our ship Le Lyrial anchored in the background. Outwash from the stream reveals fragments of rock types located higher up in the valley. The skies began to clear for us - something a person can only hope for when visiting South Georgia. The weather is often very bad here and in fact, we were blown out from both of our activities schedule on our third and last day here. In the afternoon we sailed into Cumberland Bay and got an excellent view of Mt. Paget (elev. 9,269') the highest peak on South Georgia. We were on our way to Grytviken, another important whaling station and the administrative capital of South Georgia. Giant, Southern elephant seals (Mirounga leonina) greeted us on the beach. They come ashore during the day after feeding at night. They are prolific divers and seals that have been fitted with tracking collars are known to have routinely dived between 1,000 and 3,300 feet. One individual went down 7,000 feet on one dive. One of the highlights in stopping at Grytviken is to visit the small cemetery. This is where Sir Ernest Shackleton is buried. He had returned to South Georgia for another Antarctic adventure when he suffered a heart attack and died. His remains were brought back to Uruguay with the intention of returning to the UK. But his wife said 'never mind' - he belongs down there. And so he was returned to South Georgia for burial. It is a highlight for most travelers to visit his grave. The previous visit in 2016 was a gray, rainy day and this was a much welcomed change. There was some work being carried out on the grave. Workers repairing the surround stones. The famous Frank Wild, Shackleton's Second-In-Command on the 1914-16 expedition is also buried in the cemetery. He died and was cremated in South Africa. But in 2011 his remains were placed next to Shackleton's here at Grytviken. What a lovely day for a walk! If South Georgia had more weather like this it would certainly be a more heavily visited destination. Only about 1/4 of Antarctic voyages come to South Georgia, meaning there are only about 10,000 visitors per year. Only a small fraction of those see skies like this. View inland from the top of the hike. View of Grytviken whaling station and King Edward Point, where the British ship the James Ross is docked. Walking back to the station. This is the Petrel, one of the whaling ships that worked out of Note its harpoon gun still mounted on the bow. This is the flensing area, where the whale carcasses were winched up to to be butchered. It is almost criminal to think today of commercial whaling at this scale, especially after seeing the feeding frenzy earlier in the trip along the Scotia ridge. Anchor chains lying in repose. There has been an incredible amount of clean-up that has occurred here since my first visit in 1992. The Norwegian whalers church has been completely restored. A plaque to Frank Wild is also on the wall in the church. Our last day in South Georgia was a complete washout with Beaufort force 10 winds and rain. We were unable to land at Gold Harbor or visit Drygalski Fjord. So we left early to get some extra time in Antarctica! This post is long overdue but I took a break after returning from Antarctica in early February. 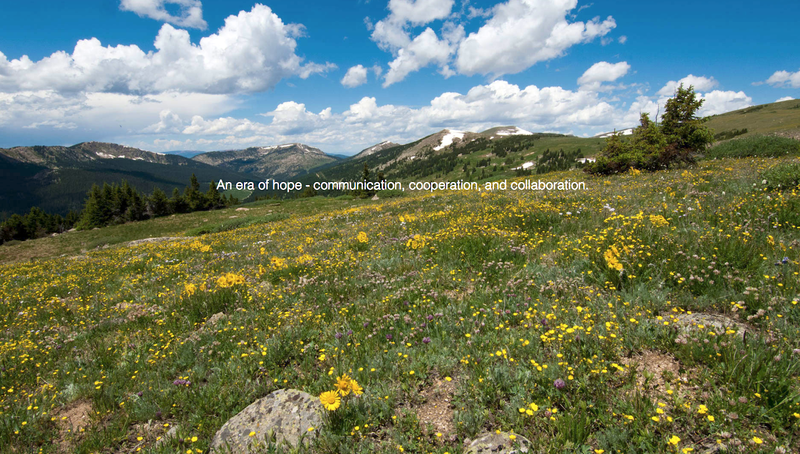 I hope to get back to blogging now as the spring season begins. Thank you for your patience. For the 29th time, I headed south to Antarctica during the Austral summer. The trip began in Argentina with a short stop in Buenos Aires and then a three-an-a-half hour flight to Ushuaia on South America's largest island., Tierra del Fuego This time I was able to take my wife Helen on the trip - her first time to South America and Antarctica. Leaving Flagstaff. Little did we know that we would miss the best winter weather hit Flagstaff while gone. Still, Antarctica was mostly warmer than Flagstaff. Leaving Buenos Aires going to Ushuaia. This part of South America was experiencing a very wet summer. Ushuaia is a unique city of about 70,000 people. It has grown like a weed in the last several decades in response to the growing Antarctic tourism trade. It began as a far-away national prison, much like our Alcatraz. Wouldn't you know it! We met two friends from Arizona while walking the streets in Ushuaia. They were finishing their Antarctic trip while we were just beginning ours. Small world indeed. We had a free day and visited the nearby Tierra del Fuego National Park with its beautiful fjords and blue lakes. The end of the road in the National Park is also the southern end of the Pan-American Highway. Only 11,000 miles to Prudhoe BayAlaska! I'd love to do it one day. There are signs everywhere in Argentina proclaiming that the Falkland Islands (or Malvinas) belong to them. The southern beech forest (genus Nothofagus) is one of my favorite environments anywhere. The greens are vibrant, well watered and welcome protection from the incessant winds. Did I mention the green that is found everywhere here? The landscape has been carved by glaciers that have receded since the end of the last Ice Age. Views like this are modern analogs for the Antarctic landscape prior to it being subjected to the 'deep freeze' which began about 34 million years ago. Petrified wood in Antarcticas is largely from the genus Nothofagus. The world's southernmost train is located within the Park. It originally went from the prison in Ushuaia to the area of the Park for the harvesting and collection of firewood by the prisoners. Wr had a wonderful free day in Ushuaia and we sailed at about 7 PM that evening. After a full day sailing east, we arrived in Stanley, Falkland Islands. These tiny islands located far south in the South Atlantic Ocean are little piece of Britain in the middle of nowhere. The Globe Tavern in the background is a place to watch football and get a pint. Helen and I took a farm visit about 35 miles out in the bush. One of the biggest geological resources here is peat, decayed vegetation that is cut into blocks for heating. The blocks are thrown up to dry, taking up to six weeks. They are quite wet when first removed, as I found out when I tried to throw one up - it slipped off of the shovel and onto my clean pants. The stain, while indistinct will be on these pants forever. Inside the farmhouse. The stove is heated with peat. Of course, we had a sheep shearing demonstration, for which the sheep were quite nervous. Beautiful, exotic lupines at the farm. The Falklands are famous for their stone runs, which Charles Darwin noted on his visits in the 1830s. See this abstract here for a description of these features. The 'whalebone church' in Stanley. Inside the church. My next post will cover a visit to South Georgia Island. In honor of the 100th Anniversary of the establishment of Grand Canyon National Park next week, the Pew Charitable Trusts asked me to be a contributor to their 15 minute podcast that pays tribute to this world-class landscape. The actual anniversary will be next Tuesday February 26. Please have a listen to the podcast here. The site also includes five of my photographs of the Grand Canyon. I will be at Grand Canyon the rest of the week and presenting a paper at the 5th Grand Canyon History Symposium. My paper is entitled, Geology for the Proletariate: The Writing of Carving Grand Canyon and Ancient Landscapes of the Colorado Plateau. I am so honored to be a part of this celebration. Incredible to think that when I first saw the Grand Canyon, it was only 54 years old. Happy Anniversary Grand Canyon National Park! 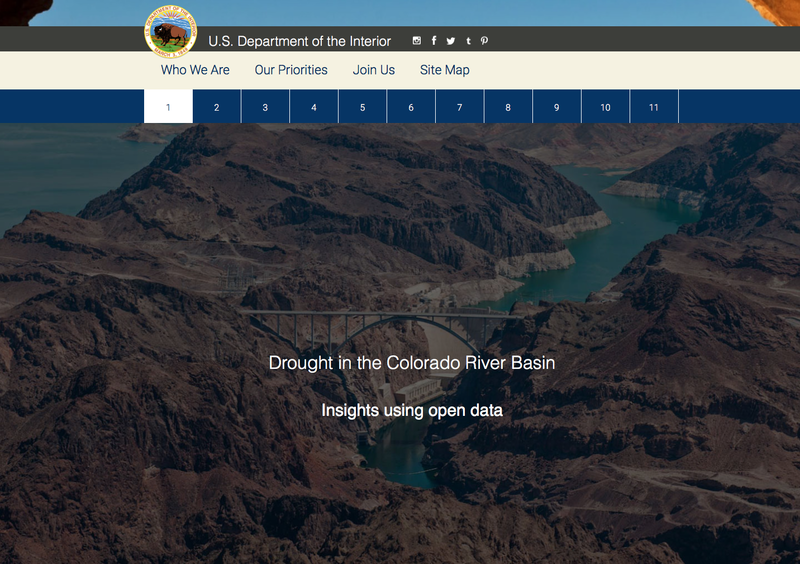 The Department of the Interior has established an interactive web site that allows users to better understand the seriousness of the current drought (since 1999) along the Colorado River drainage basin. Eleven distinct panels are expertly rendered and take viewers on a tour of the drainage basin and the stakeholders that increasingly "tug" on its water resources. You can access the web site here. 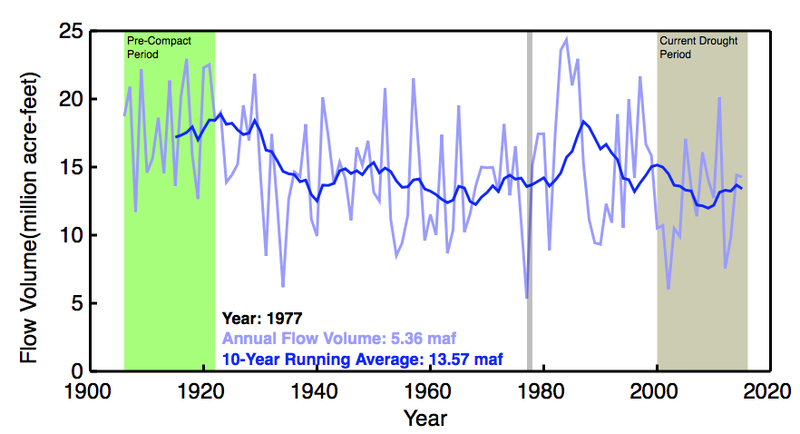 This graphic from panel #5 shows how the water supply in the river varies over time. Using your cursor, you can hover over the graphic for individual year values. In this screen-capture, I hovered over the low water year of 1977 to show that the river only carried 5.36 million acre feet (maf), compared to a 10-year running average of 13.57 maf. In this graphic from panel #8, water supply is contrasted against the ever-increasing consumptive use. In this screen-capture, I chose the very first year that use outstripped supply - 1954. Water use in that year was 10.7 maf, but the river only carried 9.6 maf. 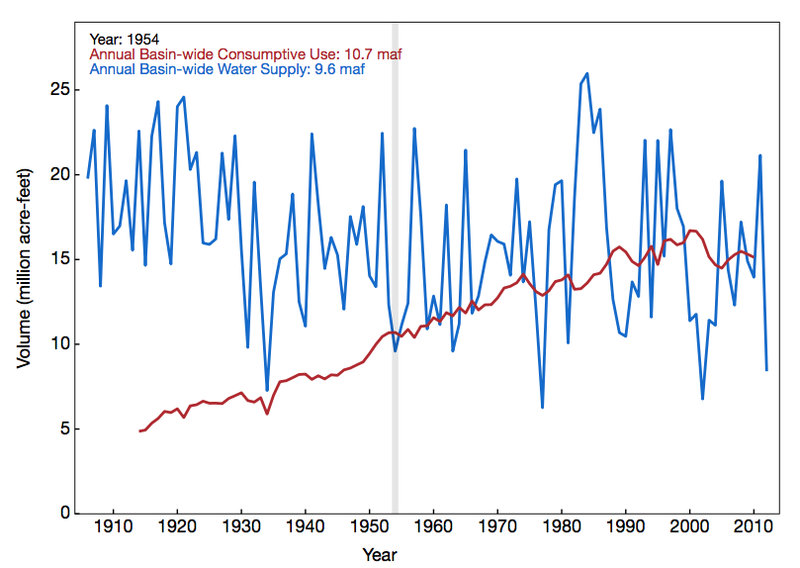 Note how the red line is on a steady upward trajectory while water supply is highly variable. Although the interactive graphs are the highlight of this site, it is also wonderfully designed with beautiful photographs. More importantly, it is an attempt by managers from the Department of the Interior and the Federal Government to begin to instill an awareness in all stakeholders about the current drought conditions. In addition, they hope that meaningful conversations about where we are headed as a society can begin and solutions can be addressed. Check it out! Of all the colorful layers of strata found on the Colorado Plateau, none is as well-known perhaps as the Navajo Sandstone. As one field report described it in exposures found in southeast Utah, the Navajo Sandstone "...usually crops out in a wide belt of rounded cliffs and picturesque domes." So many nature preserves in the Southwest were designated because of the tendency of this sandstone to erode into beautiful and wondrous shapes. Zion National Park comes to mind, as well as Capitol Reef, Canyonlands, Grand Staircase-Escalante, and more. In December, I joined two friends who also love to explore this exposures in this layer of rock. We were in a little known part of the Navajo Indian Reservation. We began our hike climbing through other layers of rock on our way to the Navajo Sandstone, barely seen in the background at the top of the photo. Here the claystones of the Chinle Formation (right) are overlain by the Moenave and Kayenta formations. All three are fluvial deposits from between 215 and 200 Ma (million years ago). In the lowermost Moenave Formation, we observed some root casts, that radiate out from a likely trunk of a small tree. The casts are composed of limestone which replaced the organic matter in the roots. As we climbed higher, we obtained a great view to the north and saw that all of the strata were tilted down to the east along a monocline. These features formed on the Colorado Plateau during the Laramide orogeny or mountain building event (the same event that caused the initial uplift of the modern Rockies and the partial uplift of the Colorado Plateau). As the shallow-dipping, eastward-moving Farallon plate tugged on the bottom of the crust here, friction between the two caused these kinks in the strata. It's important to remember that when the tilting was ongoing, the rocks shown here were still buried under about one to on-an-a-half miles of overlying rocks that are now eroded. Once the top of the cliff was achieved, we could see the dipping of the strata dying out to the east. In the far distance was the profile of eastern Grand Canyon with the South Rim seen as the flat plateau on the left and the North Rim on the right. Scott and Tony begin heading into the outcrops. Finally, we arrived on some outcrops of the Navajo Sandstone. This rock unit is interpreted as being deposited in giant sand dunes that were shaped by the wind. The cross-bedding here shows that the dunes were migrating (in this view) from left to right. Once the sand grains have been lithified into rock and eroded, they take on fantastic shapes. Note that the cross-bedding does not "disappear" upon becoming lithified - the original texture of the dune is preserved, although it may become a bit compacted. Loose sand has a maximum angle of reps of about 33 degrees but the maximum angle typically found in lithified sandstone is between 25 to 29 degrees due to compaction. In an overhang, we encountered a crude petroglyph of a Navajo horseman. Note how each distinct set of cross-beds are all oriented in the same direction. This documents the regional wind pattern at the time of deposition - about 190 Ma. Today this direction is south or southeast but in the Early Jurassic, it might have been a bit different since the North American continent was slightly askew from its present position. As we ventured farther "inland" the shapes became more pronounced as pinnacles and spires. Note Tony walking on the cross-beds for scale. Large water pockets were seen and in the early morning there was a thin sheet of ice on them. Scott admires a gigantic set of cross-beds. The small-scale structures within the outcrops reveals many intimate details about the accumulation of sand here. First, note that there are two sets of cross-beds separated by a semi-horizontal line. The cross-beds below are older and were planed off before the second set can in and buried them. The horizontal break is called a bounding surface and may represent the former position of the water table within the dune. A closer view reveals even more detail. Note the two especially dark wedge-shaped sand beds. These contain larger grain sizes and are interpreted to be where sand avalanched down from the crest. If you've ever played on modern sand dunes, you will recall that avalanching is a common occurrence on sand dunes. Note that the avalanche beds pinch out as they approach the horizontal. For these reasons, these structures are called sand flow toes. The lighter colored beds separating these are where gentle winds deposited finer-grained sand and are called climbing translatent strata. Amazing preservation of detail here! A much closer look at gravity deposited sand flow toes (dark) and wind deposited climbing translucent strata. Please have a look at this web site with descriptions of eolian terminology and fantastic animations of the processes that create them. Another fantastic find was the concentration of iron-cemented sandstone clasts in dry water pockets. Before the Navajo Sandstone was exposed to erosion here, fluids moved through the sandstone and mobilized iron in solutions. Certain chemical environments in these fluids would cause them to place the iron into solution. As the iron-rich fluids flowed elsewhere, a change in the chemistry would cause the iron to fall out of solution to concentrate within discrete beds. Then, upon erosion, the iron-rich sandstone weather into clasts and due to its increased weight cannot migrate too far and become concentrated in these "pools." More water pockets in the sandstone. The seasonal light was perfect for accentuating the cross-bedding. In the summer, this would just be flat-looking, without low angle shadows. "Waves" of cloud crashing across the sky to the south. "Waves" of cross-bedding crashing within a small gorge. There was one tricky part getting out of here. One can become "rimrocked" in this kind of terrane very easily. I was glad to had Scott and Tony as my guide in here. More evidence that we were not the first ones here, although there are very few people who come into this unknown place. Afternoon light and clouds. What a day! What a place!